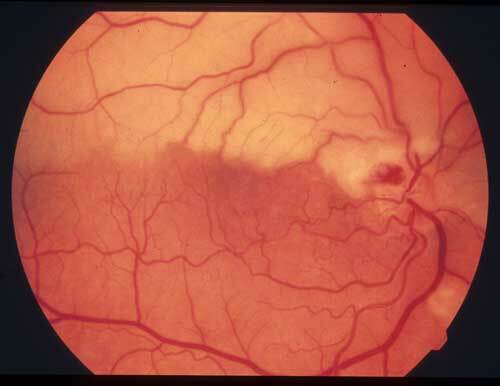 The most common cause of BRAO is an embolic event, a fibrin, cholesterol, or other plaque that breaks off from another area of the body and is carried to the retina by the bloodstream and lodges in a retinal artery. Visual loss from retinal artery occlusion is equivalent to loss of function in other parts of the body from stroke. Unfortunately, visual loss is not usually reversible, even with time. 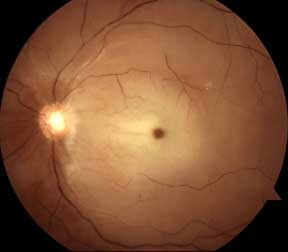 Central vision is lost suddenly if the blocked retinal artery is one that nourishes the macula, the part of the retina responsible for fine vision. Following BRAO, vision can range from normal (20/20) to barely detecting hand movement. If you have had a branch retinal artery occlusion, regular visits to your eye care specialist are essential and your eye doctor will request additional studies to assess your risk for other complications. Central retinal artery occlusion (CRAO) is the loss of blood flow to the main artery in the retina. The first sign of CRAO is a sudden and painless loss of vision that leaves you barely able to count fingers or determine light from dark. This is an ocular emergency. CRAO usually occurs in people between the ages of 50 and 70. The most common medical problem associated with CRAO is arteriosclerosis, hardening of the arteries. Carotid artery disease is found in almost half the people with CRAO. The most common cause of CRAO is an embolic event, a fibrin, cholesterol, or other plaque that breaks off from another area of the body and is carried to the retina where it then lodges in the main artery and blocks flow. Loss of vision can be permanent without immediate treatment. Retinal damage occurs after 90 minutes, but even 24 hours after symptoms begin, some vision may still be saved. The goal of emergency treatment is to restore retinal blood flow if possible. After emergency treatment, you should have a thorough medical evaluation to determine the underlying cause of your arterial occlusion. A CRAO can be a harbinger of life-threatening disease.